It is hard to believe that it was there all along. The stunning scarlet stone, majestic railway arches, ship canals, Victorian gothic architecture and gigantic cotton warehouses (where apartments now set you back Stg1m). 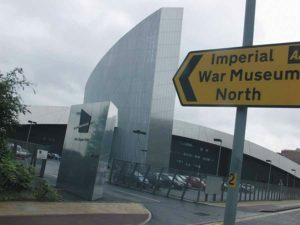 Sandwiched between England’s best landscapes: the Lake District and the Pennines, Manchester was the world’s first industrial city. The place that Benjamin Disraeli described in 1844 as “as great a human exploit as Athens”, turned into a smokey, if wealthy place, home to Lowry of the matchstick men. The better bits of that industrial city remain, the Northern Quarter – home of street art, underground music and vegan, pop-art diners. Rusholme’s strobe-lit curry mile looks like a mini Las Vegas with the best Indian food in the northwest. 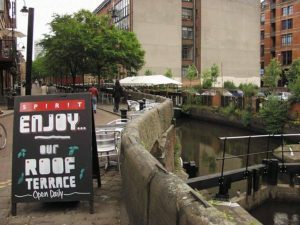 The gay village on the banks of the Rochdale Canal is rivalled only by San Francisco, and Castlefield’s canalside bars hang under the most impressive railway arches in Britain. More fascinatingly, it has turned itself back into a swan again. It is hard to say what achieved the effect. The reflections off the new polished glass architecture, but the old Manchester is more accessible than ever for tourists. They closed the set of Coronation Street, a major attraction in the early 1990s, but you can still see it if you go into the Xperience in the nearby Science museum (don’t tell them we sent you). 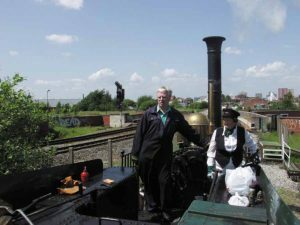 You can also ride an 1830s rebuilt steam train, revisiting the first inter-city railway service in the world. And at Old Trafford, a stadium tour will impress even the uninitiated. They will play the stadium sounds in the players tunnel so you too can be Roy Keane or John O’Shea running down the tunnel out in to a stomach-churning Champions League fixture. It started with its bid for the 2000 Olympic Games. The city spruced itself up. A five-star hotel opened. The new shops came, Hermes, Hilfiger, Mulberry, Calvin Klein. Terence Conran chose Manchester to open Zinc, his first stand-alone restaurant outside London last year. Supporting him is Frenchman Patrick Ferry, who sells 15 types of champagne at up to £130 a bottle, alongside patisserie and chocolates, in Les Délices de Champagne. Manchester missed the Olympics. Instead it finds itself hosting other things: the first Selfridges outside London, a new Harvey Nichols, £2m apartments, a Rocco Forte five-star hotel, 500 bars and restaurants in the city centre alone. The new city is second only to London in the number of designer shops, including Hermes, Armani Collezioni, Vivienne Westwood, Mulberry, Calvin Klein and Tommy Hilfiger stores. Harvey Nichols and Selfridges are opening soon. For mainstream shops – Jigsaw, Molton Brown, Muji, Space NK – head for the Triangle. King Street has the upmarket labels. Jim Thompsons Inspired by the legendary, charismatic character of Jim Thompson a brilliant American writer who lived in Thailand and was famous for his enterpreneurial skills, his lavish hospitality, ebullient personality and famous collection of Thai silks and artifacts. An exotic blend of oriental dishes made from the finest fresh ingredients. Urbis, Cathedral Gardens, Manchester (0044161 907 9077). Admission £5/£3.50. A Pompidou centre of the North, devoted to celebrating Manchester and other great world cities. The Royal Exchange, St Ann’s Square (0044161 833 9833). Admission free. The biggest room in the world when it was built 150 years ago to house the city’s cotton traders. Remind yourself that 75 per cent of the world’s cotton goods once came from the North West, and Manchester was the wealthiest city. 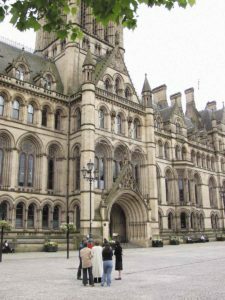 Manchester Art Gallery (open daily except Monday, 10am-5pm, free, 0044161-234 1456) The pre-raphaelite art collections of Manchester’s cotton barons, as well as works by David Hockney, Lucian Freud and Francis Bacon, are here. “On the sixth day, God created Manchester” says the signage. Not since the invention of the Kiss Me Quick hat, has anything as revolutionary happened in Blackpool. Tony Ryan’s flights into the local airport have opened the destination to new audiences from Ireland and right across Europe. Not just the clientele is new. The town is casting off old stereotypes. It offer new hotels, now ride-on attractions, new investment. The dilapidated promenade is being cleaned up and a new sea-front park and Center Parcs-style waterworld are on the way. It’s all part of a Stg1bn plan to make sure that now that Ryanair have been enticed to Blackpool, the airline never leaves and the town booms. Blackpool Pleasure Beach was added to attract the theme park generation, and has secured new ride-on attractions each year since to stay ahead of the rivals. The Pleasure Beach has recently built Blackpool’s answer to Malmaison hotels. The Big Blue is a modern hotel that sits underneath the blue arching vertebrae of Europe’s tallest rollercoaster. With its dark wood, DVD players, and suede armchairs, it might be the exclusive part of one of those pretentious Dublin nightclubs. The library, perhaps. And the Tower Ballroom is a magnificent attraction, in a large city it would be on the cultural trail. Head for the Art Deco White Tower bar to drink Martinis and watch the sun sink beyond the trident of piers that jut into the Irish Sea. The change has touched some of the institutions of Blackpool, the Tower Ballroom, the first home of BBC’s Come Dancing, the Grand Theatre, one of the oldest in England, where they have also had to rethink the billings that have changed little since the heyday of Josef Locke. The building has been restored to reveal the cavorting nymph frescos and the gloriously politically incorrect Dwarfs Bar where diminutive circus acts used to relax after a hard day being fired out of a cannon. Blackpool Tower, one of Britain’s most famous buildings, has long been associated with the aromas of fast food, Willie Wurst hotdogs and vinegarry chips from the Horace Harbuckle snack bars. At the Winter Gardens, the backstage Baronial Hall and Spanish Hall are opening up to the public for the first time. Casino operators want to open resort casinos to turn Blackpool into the Las Vegas of England. It hasn’t happened yet, and in the meantime you will hear no argument on this side of the Irish sea. Blackpool is shaking off the tat and giving itself the kind of makeover that has caught the imagination of most of those English cities who have spruced themselves up since the eighties. She has a point. Even in the tatty days there was a loyal and excited Irish clientele, braving B&Bs with nylon sheets and queues on the landing for the lavatory, many from Ireland’s own black pool, Dubh Linn. For three generations, they went for the entertainment. Blackpool is changing, but they realize that in the end, entertainment is what they do best.